Nori describes the reality of an interactive personal relationship with God; experiencing His presence, discerning what He is doing, seeing things from His perspective, and participating in those activities in the power of His spirit. Nori writes with a contagious passion. After reading just a few of Nori’s illustrative experiences I was reminded of many important spiritual lessons and was infused with a sense of excitement and a fresh reawakening of that “first love” experience with Jesus – a childlike faith and the joy of fellowship with Him and His followers. As I continued to read my eyes were also opened to the realization that as an adult there are still lessons I can learn, I need to be open and teachable. Each chapter of “The God Watchers” is filled with challenge, instruction, and new insight into the life changing truth of God’s Word. 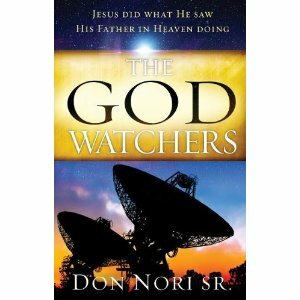 “The God Watchers” is a book for those seeking God with their whole heart, willing to yield themselves to a new life of spiritual adventure in the realm of the supernatural; daily discovering what is on God’s heart. 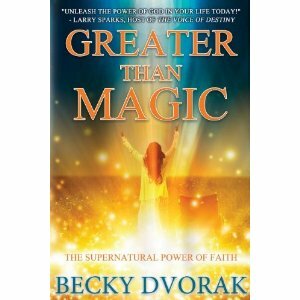 “Greater than Magic – The Supernatural Power of Faith” challenges the reader to explore the reality of walking in the power of the Holy Spirit. Becky Dvorak combines personal experiences, Biblical teaching, and practical examples from the powerful testimonies of everyday people to illustrate how to walk in the reality of the miraculous, while growing in Christlikeness. Dvorak is a gifted communicator. She brings fresh insight into the intimacy and fruitfulness that result from a deeper walk with God. Her book is endorsed by Christian ministry leaders as an important resource for equipping the reader to move into a deeper dimension of faith. Each chapter is filled with instruction for establishing a pattern for finding God’s plan, purpose, and destiny. The review questions and reflection at the end of each chapter expand the value of the book. It becomes a valuable resource for use as a guide for individual study or for interactive group study. The practical instruction and hands-on assignments provide the reader with a biblical foundation for walking in the supernatural power of faith. “Greater than Magic” will be beneficial to readers ready “to launch out into the deep things of the Holy Spirit, to radiate Jesus to the lost,” and to live for Him in these prophetic end time days. 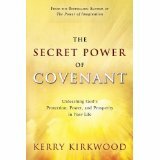 In his book “The Secret Power of Covenant” Kerry Kirkwood provides the reader with practical life-changing applications that can impact every area of life. He begins with the foundational principle of Biblical Covenants, as used in business today, and a comparison of covenant and contract. Kirkwood’s writing is engaging; his personal stories, Biblical illustrations, and the testimonies of contemporary Christians reinforce the precepts presented throughout the text. He writes with profound insight in a reader friendly style. Each chapter follows a pattern of progression; the information and instruction presented builds on the other. The material can also be read as stand-alone chapters for inspiration and reflection. The chapter titled “Messenger of the Covenant” is especially helpful in getting a grasp on the message and provision of the New Covenant. The chapter also introduces stumbling blocks to experiencing covenant blessings and the refining work of the Holy Spirit in moving “covenant” from a doctrinal belief to a passion written on our heart. Each chapter ends with a powerful prayer for the reader; for understanding, discernment, and commitment. “The Secret Power of Covenant” is an important book for anyone wanting to move into a lifestyle of experiencing God’s plan for Christian living and covenant blessing. 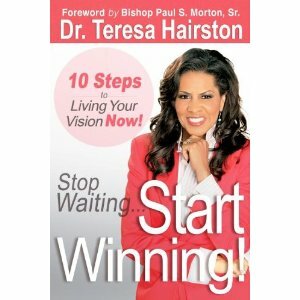 In her book “Stop Waiting…Start Winning!” Dr. Teresa Hairston clearly defines ten essential principles for accomplishing your personal vision. Each power packed chapter presents an important principle, supporting scripture, thought provoking power quotes, practical information, valuable instruction, illustrative examples, and model prayers. The material is systematically organized if four phases and skillfully developed in ten chapters making up the principles of: Positioning, preparation, publishing, perpetuation, process, patience, passion, productivity, and perseverance. I especially enjoyed her use of alliteration, her insights into Biblical studies, and the inspirational and motivational tenor of her writing. Throughout the book Hairston calls attention to the message of the Old Testament prophetical book of Habakkuk, as well as illustrations from other Old and New Testament writers. Hairston establishes the importance of getting clarity in understanding where you are on the “Vision Continuum” and in the “Vision Model” which are basic concepts to accomplishing your vision. This is a book that “begs” to be read with your favorite highlighter at hand. The “power quotes” are worthy of concentrated study, memorizing, frequent review, and assimilation. “Stop Waiting…Start Winning” is an important addition to the library of everyone seriously desirous of understanding, plotting, and accomplishing their personal dreams and Vision. P. M. Terrell skillfully combines the elements of suspense, intrigue, romance, and the unsettling sense of de JA vu in her book “The Tempest Series.” Stories of a tragic series of murders five generations earlier and a lifetime of disturbing nightmares introduce the plot of this fast moving adventure novel. The suspense builds as Detective Ryan O’Clery matches wits with a serial killer bent on revenge. Hurricane Irene is on a course of destruction moving toward the eastern coast of North Carolina when O’Clery discovers the journal of an uncle describing the Night of the Big Wind in Ireland in 1839 which also includes an account of a series of murders leading to the death of Caitlin O’Conner. When Cathleen Reilly, who has covered the recent murders of four women in Atlanta arrives on the scene in Lumberton; O’Clery is confronted with the similarities of the current crime scenes with those in Ireland 200 years earlier. Romance, action and suspense escalate as Hurricane Irene ravages the North Carolina coastline. Terrell’s writing is absorbing, brilliant in scope, classic in style, with a hard driving action plot, and unique in the personality development of resilient, believable characters. Readers will appreciate her board insights into police procedure and human nature, and word pictures and descriptions that create vivid visual perceptions of the setting, action, and the climatic uncertainty of the outcome of the fast moving complex plot. “The Tempest Murders” is destined to become another award winner for this already established internationally acclaimed author. Kirk Blackard expertly combines poignant stories, interviews, and historical background to introduce the reader to a divergence of views, opinions, and perspectives on prison reform, retribution, rehabilitation, and restoration within our country’s justice system. The book is divided into two parts. In part one Blackard traces the historical perspectives from the Colonial days to the recent explosive growth, overcrowding and crisis found in today’s prisons. Part two presents four basic Biblical principles for prison ministry based on Jesus: teaching the Gospel by living it, fostering forgiveness, building wholeness, and encouraging restoration. Through the expressed opinions and observations of lay ministers, inmates, theologians, ethicists, criminologists Blackard interweaves these perceptions as they relate to the myriad of problems faced by prison officials, political pressure, the incarcerated, family members of the inmates, faith based prison organizations, and the individual Christian reaching out in a ministry of love. “Love in a Cauldron of Misery – Perspectives on Christian Prison Ministry” has opened my eyes to see the potential of the power of Christian love to bring hope, redemption, and restoration to individual men and women condemned to misery behind prison walls. I recommend the book be assigned as required reading for those considering careers in criminal justice and for Christians exploring the opportunity of ministry with state and federal prisons or in local jails. Copies of the book are available through the Restorative Justice Ministries Network Store at http://rjmntexas.net/store.html.